Socially conscious alumni, students work for the greater global good. Rawlins brings in four decades of experience in higher education. Students' education remains UNT's central focus. 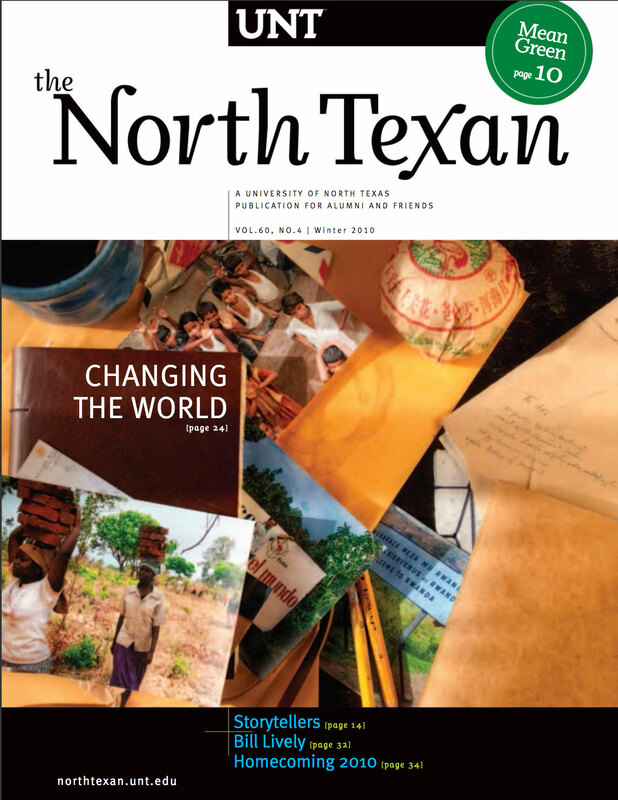 UNT journalism alumni focus on basics of good storytelling in changing field. The fundraiser transforms North Texas region's cultural landscape and Super Bowl Sunday. Homecoming 2010 takes alumni down memory lane. The Golden Eagles remember campus 50 years ago. The UNT Symphony Orchestra played in a unique venue with Tim McGraw. Writer, director, producer, actor and author Spike Lee tells students what inspired his filmmaking. Tour the art on campus with help from a new map. UNT alumnus Randy E. Pruett writes book on women, including two alumni, who won Miss Texas title. UNT alumna Cecelia Feld featured in exhibitions and corporate collections. A student recalls the horseback riding teacher. UNT alumnus James Clayton Lane sees that buildings are as energy efficient as possible. UNT alumna Meredith Smith turned to baking after being laid off. George and Pat Morey came to North Texas in 1947, and their children made it their alma mater. Alumni mentor students at annual event. Renovated concert hall creates more intimate performance space. The stadium was home to 58 years of North Texas football. Alumni share their memories. UNT welcomes head coach Dan McCarney as construction on stadium "topped out." A student remembers an art professor's act of kindness. Boarding house on Avenue A took in North Texas students from the 1920s to 1950s.